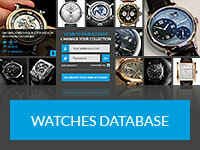 A. Lange & Söhne was founded in 1845 by Ferdinand Adolph Lange. His sons Richard and Emil improved the quality of German pocket watches to such a high level that they were competitive with Swiss watches. In 1898, the German Kaiser Wilhelm the Second gave a gift to the Turkish Sultan of A. Lange &Söhne pocket watch with his image encrusted inside. During World War II, just like all German manufacturers, Lange also produced wristwatches to be used by the pilots of the Luftwaffe, the famous B-uhr. This giant chronometer with the mechanism of a pocketwatch, was worm on top of the pilot’s jacket. The winding head had the shape of an onion so you could wind the watch without removing your gloves. To this day, B-Uhr remains the epitome among aviator watches. After World War II, when Germany was divided into East and West, the city of Glashütte in Saxony, in which was based the manufacturing centre of A. Lange &Söhne, fell into the USSR sphere of influence. In 1948, the company was expropriated. The workforce and machinery were transferred to the directorship of the Glashütte Urenbetriebe- a national company, which united all watch manufacturers in Saxony. During the era of the German Democratic Republic (GDR) the company produced a much simpler model by the thousands each year. Walter Lange – the great grandson of the founder of the company, was drafted into the German army during World War II. He remembers the horror of the war to this day. He was wounded in the leg and received treatment at a hospital in his native Glashütte. In 1948, after the nationalization of the company, the 24 year old Walter was strongly encouraged by the government of the GDR to work in the newly nationalized company, but he refused. Lange was consequently threatened with exile to a uranium production mill so he fled to West Germany. After the fall of the Berlin Wall, Lange returned to Glashütte. Forty-two years had passed since the nationalization of the company. Despite being 66 years of age and retired, Walter resurrected the manufacturing business. 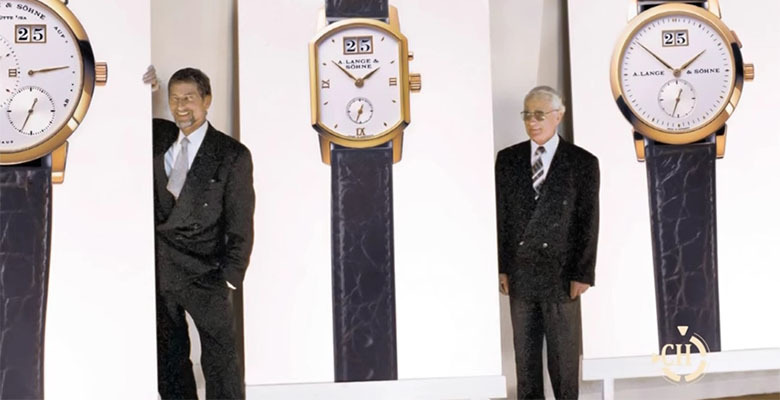 Günter Blümlein, a genius in the craft of watch-making, helped him to create the first collection, which consisted of four models finally presented to the public in 1994. The sensation on that occasion was the LANGE 1. The asymmetric watch face and a large date indicator were first of a kind in a serially made wristwatch. At this Timezone model the large dial shows the home time. The small sub dial within this home time dial shows the seconds and then there is this little day/night indicator located at 12 o’clock. The local time dial (sub dial at 4 o’clock) also has a similar day/night indicator. At 3 o’clock, you see the power reserve indicator. Simple, but Brilliant decision is the use of Roman numerals for the home time dial and the use of Arabic numerals for the local time dial.The current price 50,000 dollars. But the height of innovation for the company was the GRAND COMPLICATION watch introduced in 2013. At a price of 2.6 million dollars. Inside this watch there are seven classic watch complications: the Grand Sonnerie and the Petite Sonnerie, a minute repeater, a chronograph with a double-split function, an indicator of the instant second changer and a perpetual calendar. Walter Lange turned 90 years of age in 2014. He is certainly a living legend! What accomplishment! He returned the manufacturing business back to its historic site at the family residence and returned the brand A. Lange & Söhne to very top of Mount Olympus of watchmaking craft.